The much awaited Lenovo Ideapad A1000 has finally arrived in the Indian Market. The Lenovo Ideapad A1000 is an Android tablet which was launched some time before in the foreign markets, and now has been finally launched in to the Indian Markets. The Ideapad A1000 comes with the typical 7.0 inch screen which is the default screen size for the Tablet category. Packs with it dual stereo speakers which is further supported by the Dolby digital Plus. 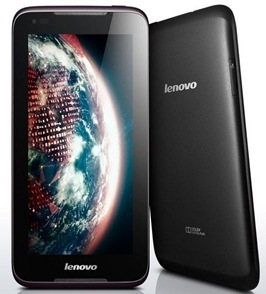 The Lenovo Ideapad A1000 is available at the company’s e-store for Rs.8,980. The Lenovo Ideapad A1000 sports a larger 7.0 inch multi touch capacitive HD screen, and the screen is all set to impress the majority of the users. It has the screen resolution of about 1024 x 600 pixels which is above the average and has the pixels density of 170 PPI which can be considered as good in the Tablet segment. So the screen will obviously attract the users who like to play the games and movies, and gives better display quality than most of the other tablets in the market at this price range. Lenovo Ideapad A1000 is powered by the MT8317 Dual-Core Processor clocked at the speed of the 1.2 GHz, and will suffice considering the requirements of the tablet and the price range in which it is available. The processor is further supported by the 1GB LP-DDR2 RAM and is capable of handling the larger apps and HD games and does not lets the device to slow down along with ensuring smooth performance. So the Processor/RAM combo seems to be impressive and will not let the performance to go down. Lenovo Ideapad A1000 comes with the 4 GB of Internal storage capacity that can further be expanded up to 32 GB via Micro SD card. So the memory section seems to cater the needs of the majority of the users and will not let the users to run out of the storage capacity, and can store most of the HD games and movies. Lenovo Ideapad A1000 comes with the front facing 0.3 MP camera that lets the users to enjoy the video calling over the Wi-Fi. Though there is no rear camera, which seems to be pretty unusual and most of the other tablets comes with the primary camera at the rear. Though considering the price of the tablet, this feature can be ignored. So the camera section of this tablet seems to be lagging behind the other competitors. Lenovo Ideapad A1000 comes with the latest connectivity features such as the Wi-Fi, Bluetooth 4.0, Micro USB(On the Go) and 3.5 mm jack for audio connectivity. It is powered with the 3500 mAh Li-Polymer battery that gives users 8 hours Wi-Fi browsing or 6 hours of Video playback or 2 weeks standby time after a single charge and seems to be impressive. Lenovo Ideapad A1000 runs on the Android v4.2 Jelly Bean OS which is the latest version and adds newer functionalities to the tablet. So the Lenovo Ideapad A1000 offers most of the must have features in the entry level segment. Ideapad A1000 comes in two colors Black and White. Though the absence of the rear camera and the calling option can restrict its further run in the Indian market. It competes with the Samsung Galaxy Tab 311 and Asus Memo Pad that comes with almost same features. Though the Lenovo Ideapad comes with the HD screen and also satisfies most of the expectations, so this tablet from Lenovo seems to be good competitor for other devices in this segment. Lenovo Ideapad A1000 is available at the company’s official e-store at Rs.8,980. Are you sure it comes with 16GB Internal Storage & costs Rs 8980? we will confirm once we get the device for review. From where you got that info about 16GB internal Storage? The company’s official link given in the same article doesn’t indicate it. Thanks for pointing out. It has been corrected, it has 4GB internal storage. Could you please upload the unboxing and gaming review video for this tab? we have asked for the a review, but not sure if they are sending the review unit. that means my Airtel sim will work smoothly, right? please let me know that internal storage 4gb is whole user interface of it will something used by the OS? And is it enough for intalling the apps??? I want to know over all performance of Lenovo Ideapad A1000 tab as i heard that we get only 512 mb to use which is very less. what are the main cons of this tab. The RAM on this device is less and it does affect the performance but not much in day a day usage for a moderate user, we have also done a hands on review of this device, you can watch at the link below.